GOOGLE, one of the most trusted brands continuously trying to keep its products more robust and secure for keeping its users safe. Google honors vulnerability hunters under its Bug bounty program and not only that, the company also offer a huge amount of reward to hackers in 'Pwnium' hacking competition for finding critical vulnerability. Google Chrome, Browser from Google product family, has been added with a new feature that it will warn the user whenever browser’s setting get altered by any malware. Browser hijacking is the modification of browser's settings, and the term "hijacking" is used when the changes performed without the user's permission. A browser hijacker may replace the existing home page, error page, or search page with its own. These are generally used to force hits to a particular website, increasing its advertising revenue i.e. Click jacking and Adware. A hijacker uses malicious software to change your internet security and registry settings to gain control over what and how your browser displays web content. "So, you're trying to download a free screensaver or a game or something else you really want. But later you find out that the game came bundled with a malicious program that's trying to hijack your browser settings. You're not the only one having this problem, in fact, it's an issue that's continuing to grow at an alarming rate," Google said on its official blog. Browser Hijacking is one of the top issues reported on browser forum. 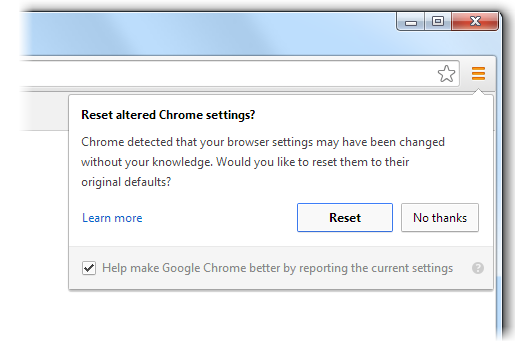 But from now, Windows chrome users will be prompted to reset the browser setting to factory default if the browser senses any sort of hijacking. Once you reset the browser, it’ll disable all extension, theme or app you would have installed on it. You can enable apps manually visiting chrome://extensions/ page. You may require restarting the browser for enjoying enabled apps.